And yet, even facilities that describe themselves as "vaccinating on intake" often don't give the vaccines until the pets have been in the shelter for several hours up to two days. Others only vaccinate animals they believe will be easily adopted, while still others don't vaccinate at all. During that time, the animals, many not be protected by immunity from previous vaccination, may have been moved to a number of locations, encountered other pets, and been handled by multiple caregivers, all creating opportunity for disease transmission. Why the delay? According to Dr. Ronald D. Schultz of the University of Wisconsin-Madison School of Veterinary Medicine, in many shelters there's a lack of understanding of just how fast protection from certain vaccines develops in dogs and cats, and without that awareness, a delay of a few hours or days may not seem critical. For example, however, within as little as a few hours, dogs can often be protected from serious consequences of canine distemper virus (CDV). Within 3 to 4 days, the dog may be fully protected from CDV and canine parvovirus (CPV), and the cat from feline panleukopenia virus (FPV). Other facilities simply haven't yet analyzed their current intake procedures in terms of disease prevention, letting other issues such as paperwork and building design or even just habit take precedence. They may intend to give immediate vaccinations, but it doesn't always, or even usually, work out that way. And in those organizations that have not committed to a high rate of lifesaving, it's often not a priority to prevent disease in animals that staff members don't think will make it to the adoption floor in the first place. But utilizing what we now know about vaccines for the common preventable canine and feline diseases in shelter populations is possibly the single most powerful weapon we possess for stopping significant disease outbreaks in their tracks. 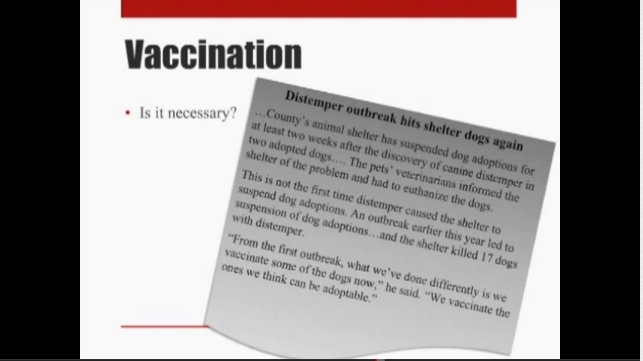 For example, during an outbreak of canine distemper virus in a shelter in 2006, Dr. Schultz recommended vaccination of all dogs at the time of pick up by animal control or, at the latest, immediately upon arrival at the facility, before the dogs entered the shelter. However, that recommendation was not implemented, with many dogs not being vaccinated until days or weeks after their arrival. The outbreaks continued, with approximately 35% of the dogs dying. When the shelter finally adopted the practice of vaccinating prior to, or immediately upon, entry, the outbreaks were successfully controlled. "This demonstrates that it was critically important to vaccinate the incoming dogs immediately on intake because greater than 65% were found to be susceptible to CDV," said Dr. Schultz. "If the changes had been put into place earlier, many of the dogs that developed disease, including those that died, would have likely been saved." PAWS Chicago, a private shelter whose intake is mostly from the city's animal control facility, found that radically redefining "vaccination on intake" allowed them to reduce the spread of infectious disease in their population dramatically. In 2009, PAWS had their shelter procedures and facilities assessed by the University of Florida and Purdue University, a process that enlightened them to just how at-risk their animals were. "We understood that we are at high risk for disease based on the sheer number of animals that come to us from animal control, and who pass through our Rescue and Recovery Center and our spay/neuter clinic," said PAWS director Rochelle Michalek2. "Last year, over 26,000 animals passed through this facility. For a vast majority, this is the first time they are receiving medical treatment and care." Rochelle and her shelter medicine team completely revamped how they were handling their intake, both to minimize disease "touch-points" and to vaccinate the animals as soon as possible. In their case, it wasn't at intake; it was before intake. They started vaccinating the pets at animal control, meaning that by the time the pets arrived at PAWS, they already had at least some immunity to infectious diseases. "We changed a number of things at the same time, so it's not possible for us to quantify what was the result of the changes in timing of vaccination," said Rochelle. "But we have seen a dramatic improvement of the health of our animals." While the majority of PAWS' pets come from animal control, they also take owner surrenders. Even though they were owned pets, many of them had never received vaccinations. "I kept thinking, 'If only we had a time machine,''' said Rochelle. So they began experimenting with different intake strategies for surrendered pets. PAWS always saves space for pets whose owners are in a crisis situation, but most of the time, Rochelle said, that isn't an issue. They are able to explain to the owner that they'd like to admit the pet after they've received vaccines, which will help make sure the dog or cat stays healthy in the shelter. Most owners, she said, have no problem with agreeing to a simple "foster to surrender" program. "We currently ask the owner to assist us in getting the animal's immunity established prior to intake," she said. "If the cat or dog is not vaccinated, they will come in for the first vaccination and then go back with the owner. 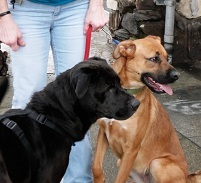 The owner fosters them for the next two weeks, after which they'll return to be officially admitted to our program and receive their second vaccination, spay/neuter, etc., and go up for adoption." PAWS follows this same procedure if the animal being surrendered is currently ill. They provide veterinary care and any necessary medication, send them home with their owners, and then re-admit them in one to two weeks. "If the owner is in a situation where this isn't possible, we will work with them," Rochelle said. "We'll take the animal in and utilize our foster network to care for them. But if it is possible, it allows you to utilize the owner's home to make sure the animals are healthy and properly vaccinated. As a result, these pets are fast tracked through our facility and into their new homes. This has been particularly valuable with kittens." Rochelle said that keeping things flexible and responding to the owner's needs is the key to the success of the program. "The most important thing I tell other shelters that ask about this protocol is, you have to ask! People are willing to help you, if they know they have options." Although delays in vaccinating are common in shelters and animal control facilities all over the country, expert veterinary opinion is overwhelmingly in favor of defining "at intake" as proactively as PAWS Chicago is now doing. 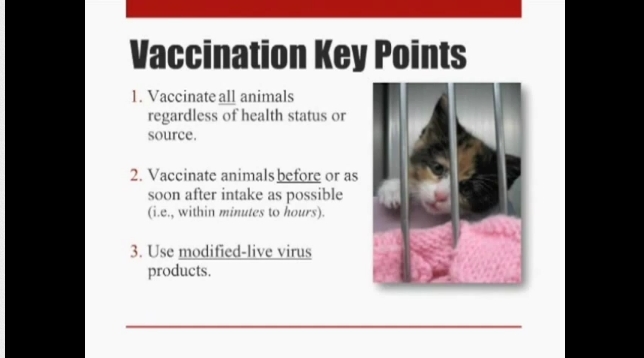 In his recent Maddie's Fund® webcast3, Dr. Ronald D. Schultz of Maddie's® Laboratory for Diagnosis and Prevention of Shelter Diseases at the University of Wisconsin-Madison stressed his long-standing advice that shelters must vaccinate every single animal being admitted immediately upon entry into the facility, if not before. In The First 60 Minutes: Animal Sheltering's Critical Hour, Dr. Brian DiGangi of the University of Florida College of Veterinary Medicine agreed, saying, "You want to be sure you vaccinate every animal regardless of its health status or regardless of its source, every one. Because you don't know who's protected and who's not. You also want to vaccinate all animals before (intake) if at all possible, if you can schedule intake... if not, as soon after intake as possible; we're talking about between minutes or hours after they come in, not days." A delay of even a day or two will significantly compromise the vaccine's ability to provide timely protection. Shelters that only vaccinate some animals, or none, or that fail to vaccinate prior to or at the instant of intake are not just increasing the risk of infectious disease outbreaks, they're guaranteeing them. On the other hand, shelters that do follow the advice of the experts and the example of shelters like PAWS Chicago will find that vaccination provides immunity to common viruses of the cat and dog much more quickly than many shelter professionals and even veterinarians realize. Immunity is not typically an "all or nothing" condition. For some diseases of concern in shelter settings, particularly respiratory illness, vaccination serves to protect from serious symptoms rather than infection. For dogs and cats who have ever been immune to CPV, CDV, and FPV, there is no period of time when they are susceptible. However, the time frame for at least some immunity to those diseases in animals who have never been previously immunized is not as long as is often believed. In a 2012 study10, Dr. Annette Litster used antibody titer tests to test the length of time it took shelter dogs to develop antibodies to two of the most common and deadly infectious diseases, canine parvovirus and canine distemper virus. Dogs from two different shelters were vaccinated with MLV vaccines, and their antibody titer levels monitored over the next two weeks. During that time period, the dogs developed immunity from their vaccines at different rates, with almost all dogs CPV antibody-positive (97.9% in one shelter, 100% in the other) and CDV antibody-positive (93.8% and 97.8%, respectively) by the 15th day. As Dr. Schultz noted11, this data does not suggest the animals were not immune prior to the 15th day. "It always takes much longer for antibody to be detected in blood than for it to be present in tissues and provide protection," he said. "It does not take two weeks for immunity." "Canine and Feline Vaccines and Immunology," Infectious Disease Management in Animal Shelters; Lila Miller, Kate Hurley (Editors); Paperback; 400 pages. July 2009, Wiley-Blackwell; Chapter 5, pp 61-82. Chapter on "Vaccines and Immunity" contains an excellent discussion of how to determine what specific vaccinations your animal population needs, as well as a thorough overview of vaccination issues for puppies, kittens, pregnant animals and those with special needs. 2011 AAHA Canine Vaccination Guidelines, the American Animal Hospital Association's 2011 canine vaccination guidelines for both companion and shelter dogs. 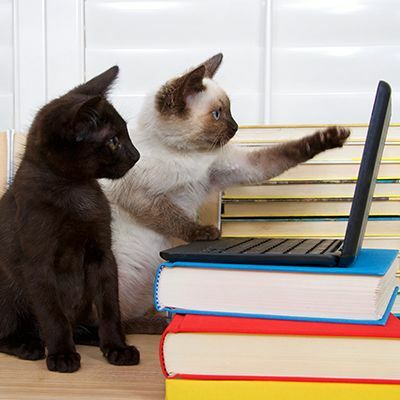 2013 AAFP Feline Vaccination Guidelines, the American Association of Feline Practitioners' Feline Vaccine Advisory Panel Report, including recommendations for both companion and shelter cats. Association of Shelter Veterinarians' Guidelines for Standards of Care in Animal Shelters (Video). Dr. Annette Litster, Director of Maddie's® Shelter Medicine Program at the Purdue University College of Veterinary Medicine, presents a review of the Association of Shelter Veterinarians' newly published Shelter Standards Document. Vaccination Protocols for Shelter Dogs: What's the Latest Evidence? Is your organization up to snuff with the latest regarding vaccination protocols for your dogs? If not, listen to Dr. Annette Litster, Director of the Maddie's® Shelter Medicine Program at the Purdue College of Veterinary Medicine, present the latest evidence at the University of Florida's Maddie's® Shelter Medicine Conference 2011. 1. Newbury, S., Blinn, M.K., Bushby, P.A., Cox, C.B., Dinnage, J.D., Griffin, B., Hurley, K.F., Isaza, N., Jones, W., Miller, L., O'Quin, J., Patronek, G.J., Smith-Blackmore, M., Spindel, M., 2010. Guidelines for Standards of Care in Animal Shelters. 2. Rochelle Michalek, Executive Director of PAWS Chicago, personal communication. 6. Brun, A., G. Chappuis, et al. (1979). Comp Immunol Microbiol Infect Dis 1 (4): 335-9; Immunisation against panleukopenia: early development of immunity. with a Live, Modified Feline Herpesvirus Type 1. 11. Schultz, R.D., private correspondence with Maddie's Institute, April 2012.